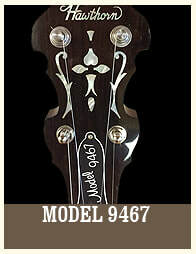 Our Hawthorn® five string resonator banjos are our pride and joy. These banjos feature the finest wood and metal parts and the same meticulous standard of construction, fit, and finish as our Hawthorn guitars and mandolins. We have several different models of banjos, generally following the classical Gibson formats but each having its own unique touches. 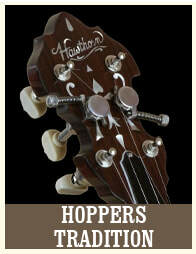 We offer several banjos that few other builders offer. 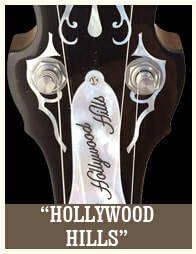 Our mahogany Bowtie banjos have proven popular and we don't know of any other builder offering our unique maple Bowtie. We also offer both RB-7 style and RB-12 style top tension banjos, which follow closely on the Gibson designs built from 1937 through 1941. We can offer virtually any tone ring and rim combination but we do have our favorites which we recommend for each model. 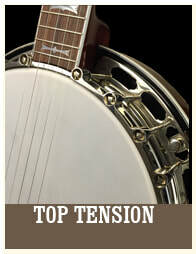 We also offer our own Ozark Thunder tone rings on any of our banjos. Our Style 4 No Hole walnut banjo is built around our Ozark Thunder No Hole tone ring mated to a Brian Sims "Fat Rim," and replicates the original handful of these tone monsters made by Gibson around 1929 and 1930. 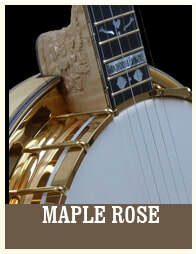 We think our Maple Rose banjo is the most beautiful and musical production banjo being made today. And a lot of banjo players have agreed with that assessment. 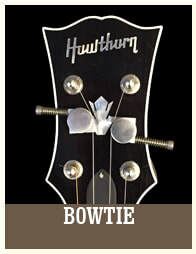 We don't think you will find a better new Bluegrass banjo than our Hawthorn banjo.